I recently found some old notes which I had planned to turn into some sort of memoir/record of our holiday to New Zealand, back before we knew we were going to come and live here. Even as I started writing about it all, things were changing for us, we were making the push to move here for good. I have many projects on my mind, as is usual for me, but this one I plan to finish. Not just for me, but for my children too. As long as I can remember I have been drawn to the ocean. A wrenching, grasping need to be near water. I never thought much about it as a child, the village I called my home was a mere two miles from the nearest beach, and I spent many hours as an adolescent sitting on the sand, watching the seas churn and shift and surge. My life led me progressively further and further away from the coast, and yet usually still close enough for me visit and dip my toes in the icy water when I wished. Until later, when I found myself settling in a place almost as far away from the sea as I could get; and I felt the loss of it in my heart and in my bones so strongly it seemed to actually hurt me. It would be wrong to begin telling the tale of this adventure without first acknowledging how lucky we have been to experience it. A chain of events beyond anyone’s control brought about situations and circumstances that none of us saw coming and never, ever dreamed would be possible. Some say the universe works in strange ways, but I remain convinced it works in exactly the way it should. Serendipity or otherwise, opportunities pieced themselves together like sections of a jigsaw, pushing us along a path that we had sought to tread for many years but had lacked the means to follow. From a period of sadness and indecision, of frustration and resignation, a door was opened to us, and a means of following our dreams was presented. In the late spring, early summer of 2016 we were aware that we had the financial means to make some serious choices and changes to our life. One of those saw my husband resign from his job of 14 years and strike out independently. It wasn’t an easy choice, there was still so much fear there, worries about what could go wrong. You become indoctrinated to the working world, even when you hate it and can see so much wrong in it, taking that chance to escape seems like a hoax, a joke, a ploy to trip you up and laugh at you as you fall. It took courage and determination to cut the threads and create his own business, and I cannot fault his passion or drive. Yet I knew he still wasn’t truly happy, and when an offer of part-time work came up, he was hesitant but couldn’t fully explain to me why. He didn’t need to explain, I already knew that a part of him saw his freedom being removed from him again. The job was good, the hours and pay fantastic, but he needed to be free for a while, he needed to let go and see more of life before it swallowed him up. Hell, we both did. I’m not sure what possessed me that night, sitting on our bed, talking and swapping ideas, but I knew it was the right decision. I told him we should travel, that we should use some of the money we had saved and go where he had always wanted – to New Zealand. Absolutely nothing was stopping us now, except the excuses we gave ourselves. I think I scared him, showing him that his dream of over ten years was possible, attainable. That which we had been saving for, for so long was now within our reach. Do you ever feel sometimes that you have promised yourself you are working towards a goal, but deep down you aren’t fully sure if that goal will ever be reached? I think that’s what New Zealand felt like to us. Every time we had saved enough for the flights, something would happen that would demand the use of those savings. Broken down cars, washing machines that blew up, all those stupid domestic problems that life throws at you and leaves you with little choice but to attack them head on and deal with the fallout. Knowing that the cash was finally and actually there, that all we had to do was use it, it was the strangest feeling. We all cried that night: myself, my husband, and our two kids. We cried not out of sadness, but out of terrified anticipation and excitement. The decision was made, and yet we still dragged our feet at first. I’m not sure why, I suppose there was still a reticence there, an uncertainty. It would be the first time any of us had ever flown, and the flights were long-haul – almost 28 hours of travelling, plus at least an hour’s car journey to the airport. We were understandably nervous. I joked about it afterwards, “go big or go home” I would say, because in retrospect it felt slightly crazy, somewhat unreal. I booked the flights one Sunday afternoon, after what seemed like weeks of messing around. I didn’t think about it too hard, I just made the decision and did it. It was beginning to feel like if I didn’t get it done, it might never happen. So we booked a date: 18th October, fly from London Heathrow to LAX at 16:15. Due to crossing time zones we would land in Auckland on the 20th at 6:20 in the morning. I set to making an itinerary, a list of things we could and should do and places we wanted to go. We already knew that we were going to see as much of the country as possible, touring both the north and south islands, but the logistics of it all, and the practicalities were initially unclear. We toyed with the idea of hiring a camper van, but neither of us were really that keen on the idea of driving a hulking great piece of machinery along unknown roads, so instead we started looking at AirBNB and places that we could stay in for a few days at a time, allowing us to have a base but be flexible at the same time. We were also very clear that we wanted to stay in Wellington, the capital, for longer than some other places. It took almost two days of map checking, route planning, apartment booking and trying to figure out how it would all fit together, but eventually we had a clear plan. We would land in Auckland and stay in as cheap but clean a hotel as we could find close to the airport, and hopefully ride out the worst of the jet-lag. From there we would hire a car which would be our main method of transport across both islands, also taking it on the ferry between Wellington and Picton to travel to the south island. Our route took us from Auckland along the Pacific Highway to Cooks Beach, Whitianga; down to Tauranga and the Bay of Plenty; across the island to Taupo; downwards to the southern coast and Wellington; across to the south island and down SH7 to Ohoka near Christchurch; back up to the north island and to Wellington once more before finally driving almost the entire length of the north island to Raglan on the north-western coast. From there we would return to Auckland for our flight back home. It would be five weeks of intermittent travelling and exploring with a minimum of 1750 miles of driving – the full length of the U.K. and back! I’ll spare you the details of planning, preparation and packing, but suffice to say it was quite fraught and required the creation of many lists and last minute purchases to ensure we were fully prepared for the journey. I detest packing for holidays, I find it so incredibly stressful as I am the sort of person who has absolutely no idea what they want to take with them. In some ways, a journey of this length can be slightly easier to pack for as you know if you forget anything you will simply buy it on the other side, and for the most part you don’t need to take every toiletry or item of clothing as you can factor in places to wash and dry and shops to buy what you need. Yet this knowledge doesn’t seem to alleviate the stress of trying to ensure that a family of four are prepared for a five week trip on the other side of the world! The plane journey, even though it was the first for all of us, actually ended up being quite uneventful. Once we had got through the process of customs and boarding and finding our seats, it was merely a matter of settling in for the long haul. The take-off was not at all like I expected, although to be fair, I’m not sure what I did expect at the time. My friend had told me it was a bit like riding a rollercoaster as it climbs up to the top of its tracks, and he was quite right. Of course that didn’t stop me feeling utterly terrified in the run-up and probably for the first couple of hours. We were seated in economy, in a row of four seats in the middle of the plane and we could have been locked in a simulation for all we knew. We saw nothing of the world as we crossed it as we were so far from the windows, and we entertained ourselves with the in-flight movies and games when we weren’t sleeping. I won’t speak of the food we were served, I believe everyone is pretty much in agreement that flight food is mostly always awful. Transiting in Los Angeles was a strange experience, getting off the plane to go through customs simply to get back on the same one and in the same seats. Despite having little experience of it all, it went reasonably smoothly, if a little hectic in parts. Throughout all of our journey it has become very much apparent to me that people will almost always treat you in the way you treat them, and so with a positive and friendly attitude we were able to navigate all issue that came our way. Of course I also feel like our flight experiences were improved by the fact that my youngest was carrying his giant stuffed panda toy, almost half the size of himself, through the airport. Even the most hardened customs official seemed to melt a little when faced with the prospect of scanning a cuddly panda. I also have no doubt that being a nice, polite, white family gave us a certain amount of privilege and allowed us much more scope than others experience. 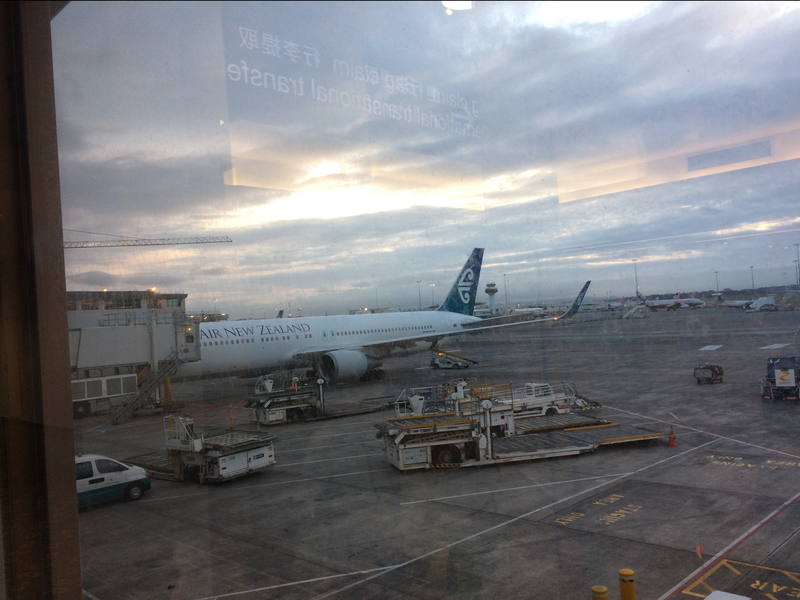 When we finally landed in Auckland, we had been travelling for almost 28 hours straight. The jet-lag was weighing on us all very heavily, but unfortunately we couldn’t access the hotel room we had booked until after 2pm. I remember that we had some vague sort of breakfast in a cafe in Auckland airport, and that I was fascinated by the number of small birds which kept flying in and stealing dropped or forgotten food. I remember walking from the airport to the hotel, which in retrospect was a huge mistake as it was much further than we realised. I recall coffee and cake in another cafe, and fighting the urge to put my head down and sleep right there at the table. By the time we finally got into the hotel that afternoon I do not think I had ever been so happy to see a warm shower and decent bed so much in my entire life. I don’t think it really sank in until the next morning when I looked out of the hotel window at the view, and realised with a jolt and a thrill, that I was quite literally standing on the other side of the world.